Tolboe and Woolton Construction company, Provo, Utah, is apparent low bidder on a contract for the construction of two sanitary sewage disposal plants, the U.S. Atomic energy commission, Idaho operations office, announced thursday. The company’s bid of $75,803 was apparently the lowest of 17 opened February 14 by the Idaho operations office’s contract board. J.O. Young and Son, Nampa, was second lowest bidder with a proposal of $77,908, followed by United Engineers, Inc., Ogden, Utah, at $83,798. Other bidders were Brennan and Cahoon, Inc., Pocatello; Olson Construction company, Salt Lake City, Utah; Gibbons and Reed company, contractors, Salt Lake City; J.H. Wise and Son, Inc., Boise; Mayer-Osborn company, Denver; Haggerty-Messmer company, Bozeman, Mont. ; Arrington Construction company, Inc., Idaho Falls; M.J. Brock and Sons, Los Angeles; Joe Lundberg Construction company, Seattle; Lee Hoffman, Portland, Ore.; Lovedahl and Sorenson, Idaho Falls; W.T. Grayson, contractor, Pocatello; Young and Smith Construction company, Salt Lake City; and C.H. Elle Construction company, Pocatello. Work covered by the contract will include construction of Imhoff tanks, trickling filters, settling tanks, sludge drying bed, chlorination equipment and chambers, and necessary mechanical and electrical work. The plants will be installed at AEC’s reactor testing station near here. Bids are now being analyzed, and the contract award is expected to be made within a few days. 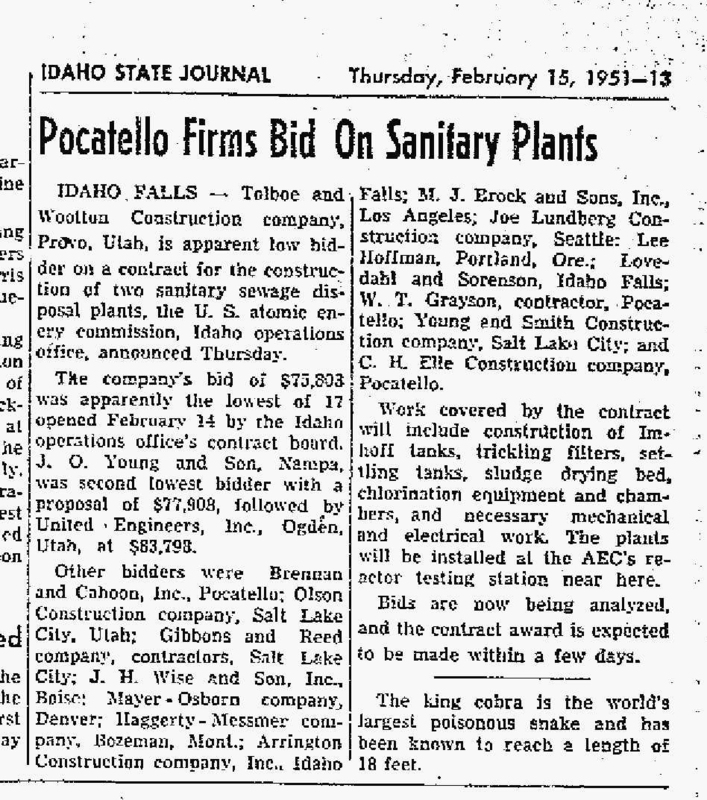 This entry was posted in Eugene Mayer, Mayer-Osborn, Their Work, William Osborn and tagged AEC, Atomic Energy Commission, construction, grain elevator, Mayer-Osborn Company, Pocatello Idaho, sewage treatment.